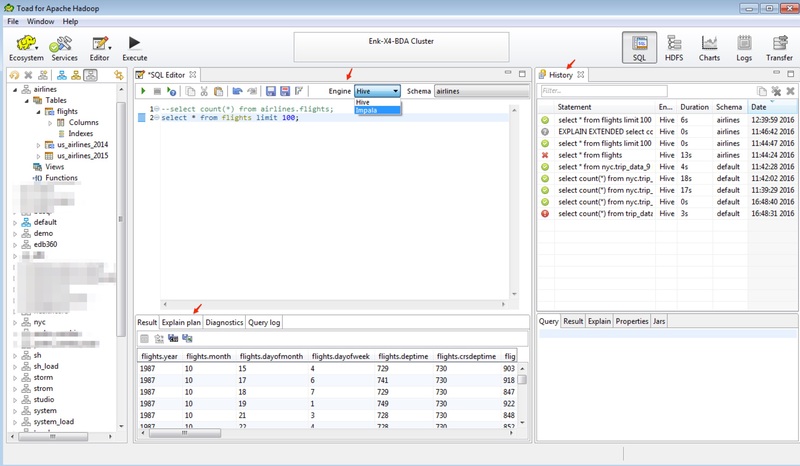 Sometime back I wrote a blog about Use SQL Developer to Access Hive Table on Hadoop. Recently I noticed another similar product: Toad for Hadoop. So I decided to give a try. Go to Toad for Hadoop. Click Download button. The zip file is 555 MB in size. I installed the software in my Window VM. 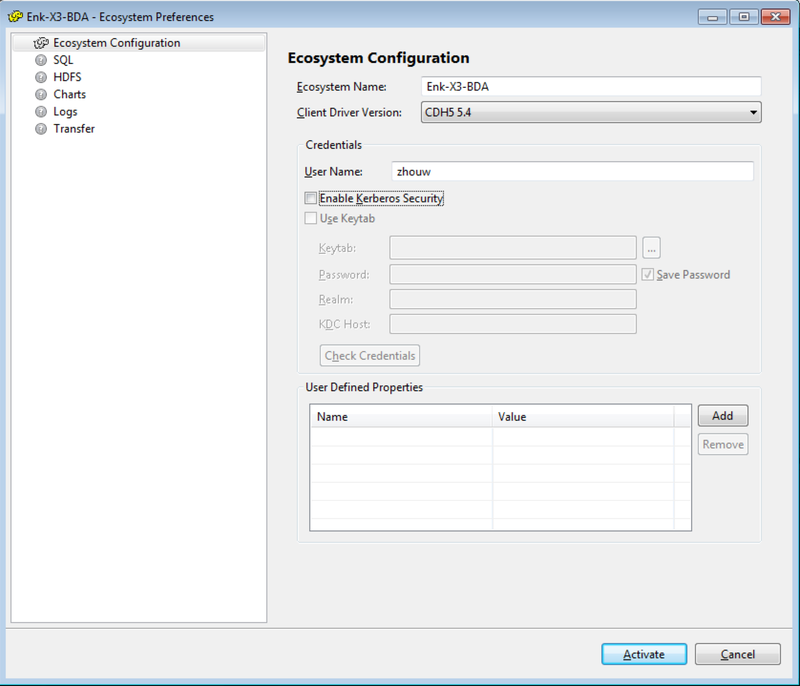 Just double clickToadHadoop_1.3.1_Beta_x64.exe file and take the default values for all of installation screens. At the end of installation, it will open the software automatically. Unlike so many buttons in the regular Toad software, this one looks quite simple. Click the dropdown box on the right of Ecosystem box, then click Add New Ecosystem. 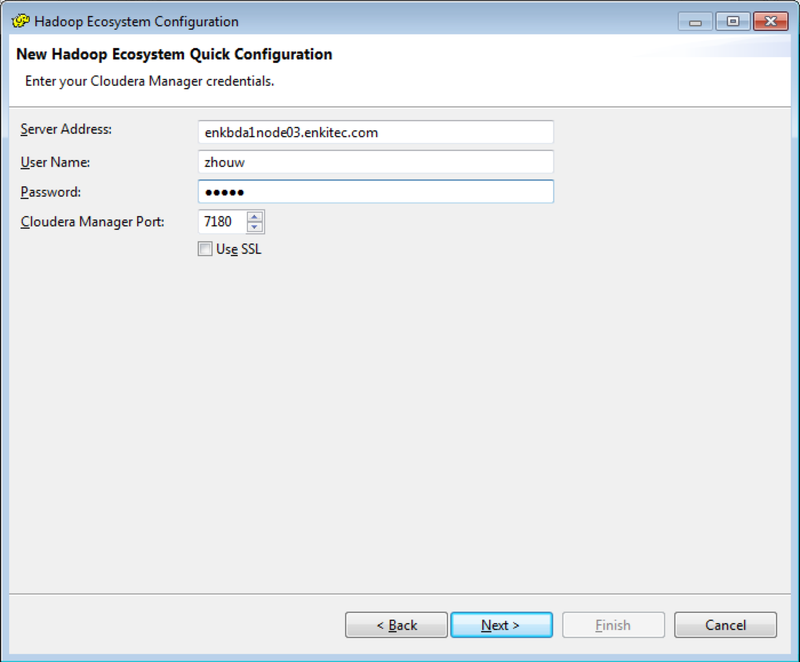 TheSelect your Hadoop Cluster setup screen shows up as follows. Input the name you want for this connection. For this one, I configured the connection for our X3 Big Data Appliance (BDA) full rack cluster with 18 nodes. So I input the Name as Enk-X3-DBA. 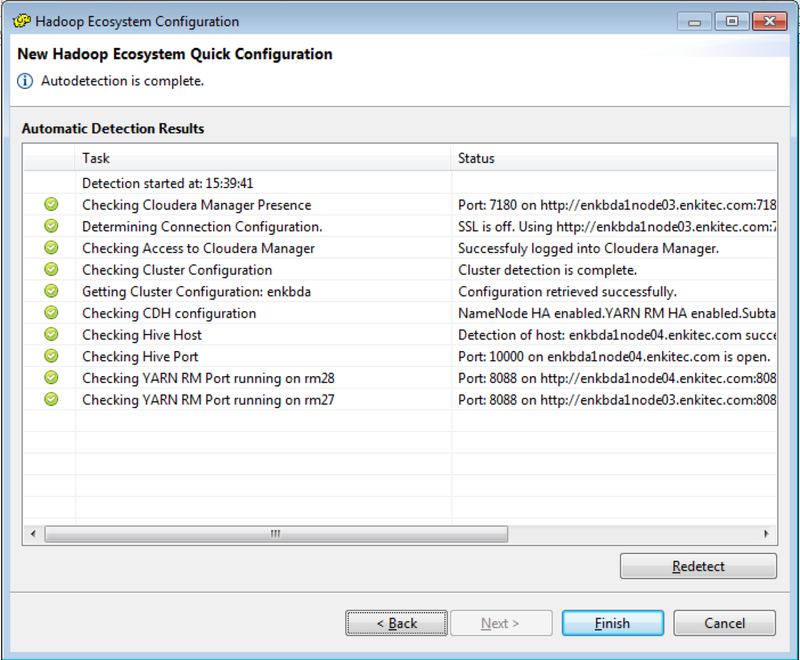 For Detection Method, you can see it support Cloudera CDH via Cloudera Manageror Hortonworks HDP via Ambari. 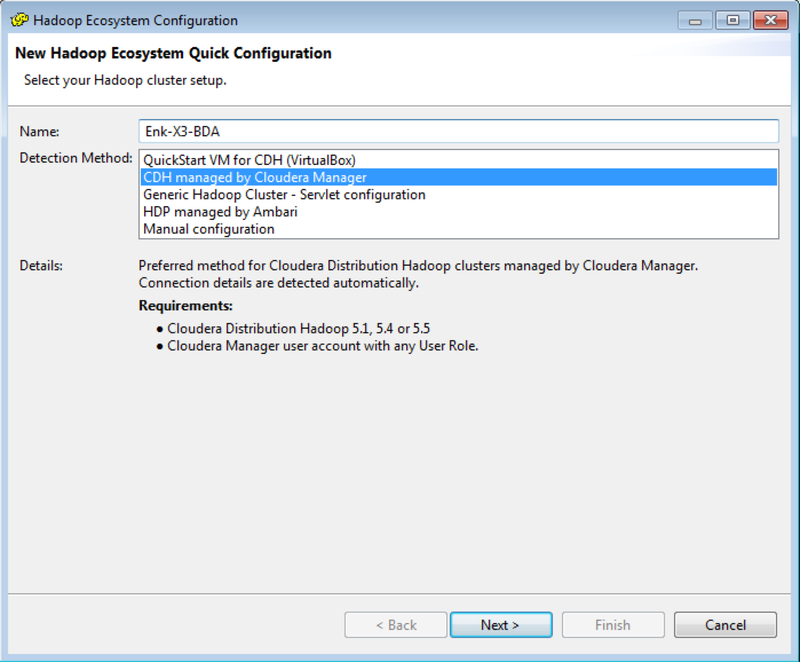 For this one, I chose CDH managed by Cloudera Manager for Detection Method. Next screen is to Enter your Cloudera Manager credentials. Use the same url and port number that you access your Cludera Manager for Server Address. The user name is the user name you access Cludera Manager. Make sure you create your user directory on HDFS before you run the installation of the software, for example, create a folder /user/zhouw and change the permission to zhouw user for read/write access. Otherwise you will see permission exception later on. Next screen shows Autodetection. It does many checks and validations and you should see the successful status for all of them. Next one shows Ecosystem Configuration. In this screen, I just input zhouw for User Name. Then click Activate button. There is a bug in this version. Sometimes both Activateand Cancel buttons disappear. The workaround is just to close and restart the software. The most frequently used screen is SQL Screen. You can run the SQLs against either Hive orImpala engine. 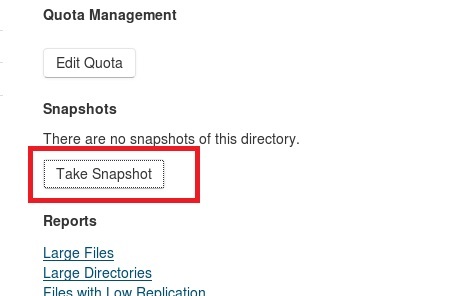 Navigate to the directory you want to enable for snapshots. Navigate to the directory with the snapshot you want to restore. File system metadata is distributed (think of it in terms of many mini name nodes). No central name node is needed. This eliminates name node bottlenecks. MapR-FS is written in C. No JVM garbage collection choking. NFS mount. You can mount the MapR-FS locally and read directly from it or write directly to it. MapR-FS implements POSIX. There is no need to learn any new commands. Your Linux administrator can apply existing knowledge to navigate the file system. You can view the content on MapR-FS using standard Unix commands, e.g. to view the contents of a file on MapR-FS you can just use tail <file_name>. 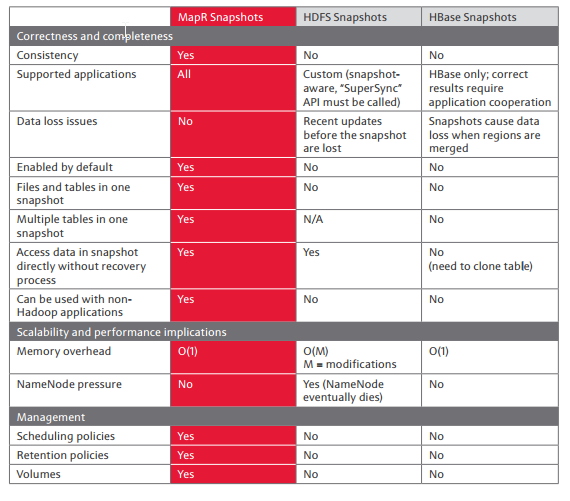 While MapR-FS is proprietary it is compatible with the Hadoop API. You don’t have to rewrite your applications if you want to migrate to MapR. hadoop fs -ls /user on MapR-FS works the same as ls /user. 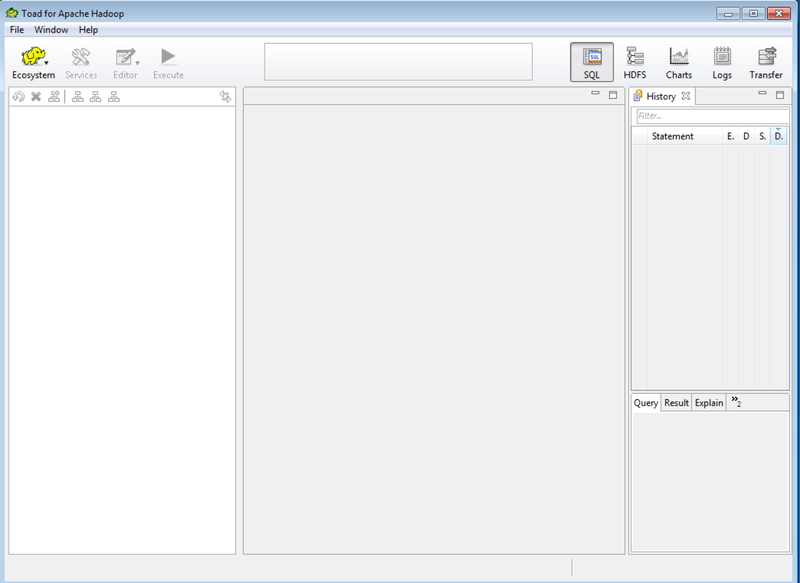 You can directly load the data into the file system. No need to set down the data on the local file system first. Guess what? Using NFS mounts there is no distinction between MapR-FS and the local filesystem. MapR-FS in a way is the local filesystem. No additional tools such as Flume etc. are needed to ingest data. True and consistent snapshots. Run point in time queries against your snapshots.